Tymal Mills is hoping to conquer Finals Day so he can tick it off his list. 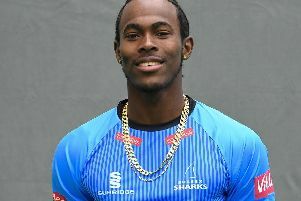 The left-arm pace bowler hopes to play a part for Sussex after being involved in Finals Day before with Essex, but never playing. Mills is looking to go all the way with Sussex as they attempt to win it for the first time since 2009. Mills said: “It’ll be my first time playing. I went with Essex when I was younger but I was 12th man so didn’t play. We lost in the first semi-final so I’ve experienced it a little bit. “I’ve commentated there for the past couple of years so I’ve been around it and seen what it’s like to win it, I just haven’t had the chance to play in it so far so I’m really looking forward to that. Mills, 26, has played in different T20 tournaments before, including overseas, but says the Vitality Blast is much different from T20 competitions overseas he’s experienced. He said: “It’s different. It’s much longer which is fine living in England. It has its different challenges. It’s more diluted than other competitions because there’s 18 teams as opposed to six to ten. It’s nice to get to stay at home and play in front of the home crowd while we’re here. Can batsman's lucky socks help Sussex win?